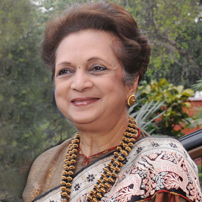 Mrs Abha Dalmia is co-founder of FICCI Ladies Organisation . Along with Mrs Indu Jain, she was responsible in initiating the birth of FLO in 1983 and became its President in 1984. FLO, with its strong setup , has grown to become the leading business organisation for women in India with 13 Chapters and a membership of more than 4000. She is very active in the Past President’s Council and acts as a Mentor for FLO. The Dalmias have been a pioneer family in India with its roots in pre-partition. The Dalmia Group , known earlier as the Dalmia Jain Group , was founded by Late Shri Ramkrishna Dalmia and his brother Late Shri Jaidayal Dalmia in early 1920s. The legacy is being taken forward by the next 2 generations. The Group is involved in multi layered investment with its flagship Landmark Holdings Pvt. Ltd. The Company is a well known investment firm providing advisory and consultancy services and also provides advisory services to overseas investors from the year 2009 onwards. Mrs Dalmia has been involved in the Travel Trade for the last 40 years , earlier looking after Govan Travels, and now runs Grandeur Travels & Tours . She is well travelled and attends different conferences around the world. Supporting numerous causes and for the upliftment of the weaker sections of society. She is personally involved with the running of the popular Dalmia Atithi Vihar in Puri , estabilished for the benefit of pilgrims visiting Puri. Mrs Dalmia has been associated with the textile industry for the past 40 years. She took it upon herself to give life to the dying Benarsi textile by meticulously creating an interest and reviving antique designs with a modern ethos. She works hands on with the poor weavers of Benaras through her company LIFE in order to give them a strong financial support. Her products are available only in select exhibitions and are not marketed commercially. She is a prominent figure in the cultural scene of Delhi , and is the Chairperson of the Programme committee of “Samagam”, a cultural society in the Capital conceptualized and formed by a body of eminent industrialists and philanthropists to contributing in preserving our golden heritage by holding meaningful cultural programmes of seasoned artistes and new talent.